Tuesday, June 29, 1982—up early and went to Dan’s to move a fuel tank. That was a heck of a job too, but we got it moved to a new position. The women helped, just like we did. Nadia called from Seattle. She’s coming up to see us. Dan flew Patti, Sylvia and I to Fire Lake at Birchwood to meet Nadia. She came in on the plane and a lady (Billman’s relation) picked her up and drove her to Fire Lake to Dan’s plane. After Nadia got here, Dan took off with the plane. He wanted to show Nadia things on the way. It’s over a 130 miles of flying from Fire Lake. He showed us moose, swans and salmon, the trap cabin, and Old Boot Lake. He would have flown us up the Nelchina Glacier, but as he rounded the corner to go there, he met winds that he did not want to fly in. As a smart pilot, he did not go there. We then went for pizza and had Dan and Patti with us. Wednesday, June 30, 1982—went to Dan and Patti’s and loaded the stand for a gas barrel and moved it from their old place. This was a 500-gallon one. We moved it down to their new property and put the tank up on this stand. Then we went to KROA and then the Ranch House and had supper. We came home early. Really a nice evening, we sure enjoy having Nadia here. Thursday, July 1, 1982—slept late and then loaded the dredge, went to Cache Creek and I showed Nadia how the dredge is set up and worked and how to pan gold with it. We ran the dredge but didn’t get much gold at all. Then we went to Ken and Jackie’s for supper and to see how the pump repair was coming along. It’s a real nice day and Nadia had a good time—and we with her. Friday, July 2, 1982—up early and took Nadia to Anchorage for the plane. Sure wasn’t much traffic on the streets of Anchorage at 3:00 a.m. Did lots of research for prospecting at Coghill while in town that day. Got some parts, gas and grub, got home at 8:30 p.m. and went to Dan’s and called Ken about the Cat pump repair. 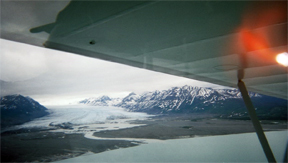 This entry was posted in Journal Entry and tagged dredging on Cache Creek, Nadia visits, Nelchina Glacier. Bookmark the permalink.